This book may, arguably, be considered a classic in the field of runic work. Originally copyrighted in 1988 (and originally published by Weiser in 1990) it is still in demand today. It is the final installment in a trio of books (with Futhark: A Handbook of Rune Magic and Runelore: A Handbook of Esoteric Runology ) which is intended to provide a basis for understanding the Germanic runes, their history and interpretation, and their relevance in our modern world. Each entry contains a wealth of information. The standards are there – Phonetic value, the Germanic name, and the most common English name – but that is just the beginning. There are several sources for runic interpretation in the historical literature (“Old English Rune Poem” (OERP), “Old Norwegian Rune Rhyme” (ONRR), and “Old Icelandic Rune Poem” (OIRP)), and stanzas from each are examined for each of the Elder staves (symbols, in common usage). There is not universal agreement among these sources, covering as they do, a variety of times and locales, and this very disagreement offers insight into the cultures involved, and the understanding of runecasters through time. If you have had no previous exposure to the use of runes, it would definitely be advantageous to do some reading before starting into this book. Admittedly, my own runic experience is extremely limited, but I have had some exposure to, and use of, the runes and the culture(s) they developed in so I wasn’t floundering in the dark. Assuming the first two books display this level of commitment and dedication to expanding knowledge of runecraft (and I haven’t seen them, so I don’t KNOW that they do even if I do expect them to), this set needs to be a part of the training materials available to novices. Dr. Thorrson (doctorate in Germanic Languages and Medieval Studies from the University of Texas) has made every effort to be both comprehensive and easily understood in his presentation. Moving beyond the basic, though by no means simple, interpretation of the individual runes, he devotes time and space to various forms of layouts and what they can contribute to the understanding of the information and guidance which is provided. This is NOT a book about “fortune telling”, nor is it a book about “games” which can be played with the runes. It is an attempt to help the reader attain a proper mind-set or consciousness which is susceptible to influences beyond the realm of normal sensory input, so that insight may be attained about what is occurring in the present and how that may influence what is yet to come. 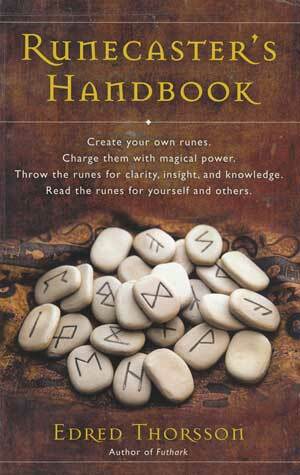 If you are interested in the subject of runes, and want more than a simple “pop” approach, I highly recommend this book.